This is going to be a short review, probably the shortest I've ever done here at Harvest Moon Music. Whether an album is good or bad, I find that there's plenty to say about it. When an album is completely uninteresting, however, words are difficult to come by. 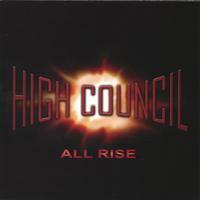 All Rise is the first demo from Pennsylvania's High Council, a power metal band inspired by bands such as Iron Maiden and Helloween. Musically All Rise has something going for it. The riffs are crunchy, the bass is galloping and distinct, and the solos and leads are tight. The songwriting is fairly complex, with good use of tempo shifts, but the demo suffers from a very bland vocal performance. Bob Saunders is an underpowered vocalist, delivering an off-key performance for much of the album. Add to that the fact that the lyrical content is quite preachy (in an evangelical sort of way), and I'm completely turned off. Gospel Metal may have it's fans, but I am not one of them. If All Rise were an instrumental album, I'd give it a significantly higher score. As it stands, however, a substandard vocal performance and uninspiring lyrical content relegate this one to the dust bin. High Council has gone on to release another demo and a full-length, but I haven't taken the time to find out whether or not Saunders has improved (nor will I likely invest the time, either). If Gospel Metal is your bag, then you might want to investigate further. Most metal fans can safely pass this one by.